In case you missed it Christmas is just *in take of breath* 32 days away and in Manchester that means one thing… a giant Santa looms over Albert Square. The city wept when the famous inflatable Farther Christmas went to a better, snowier place in the sky in 2007. The fat fella was replaced with a bigger and brighter St. Nic that has light up the Manchester Christmas Markets each year since. I’m a sucker for this kind of thing, I bought (and still own) Nabaztag after all! For a start I’d love to see more arts organisations experimenting in this area, imagine art works tweeting through a Little Printer for example – with a bit of imagination the opportunities to delight are endless. Manchester Santa image c/o mjtmail (tiggy) licensed under Creative Commons. 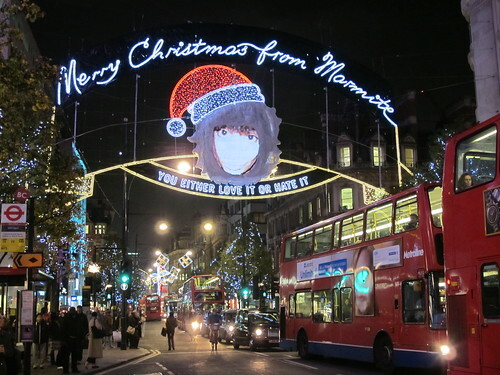 Marmite Christmas Lights, Oxford Street London image c/o Rain Rabbit licensed under Creative Commons.